At the school in Moscow, Bogin spent 45 minutes with each of the three, speaking to them in English. He gave Danya an algebra problem that was clearly too hard for her. He constructed the outline of a fish with toothpicks and asked Arden to make the fish face in the opposite direction by moving only a few pieces. He had Emmett take apart and rebuild a house made of blocks. He seemed to care about the way they thought, not what they knew. It makes your knees weak, right? Throughout the article, which is terrific, there are bits about how Bogin thinks about education, how Levy's kids responded, how they developed relationships. I won't retell what's in the article, although I'm tempted, I'll just say that Bogin as he's portrayed here is the kind of dynamic educator about whom people build up terrific teacher fantasies, and they should! Because the way Levy paints him, Bogin is someone who thinks forcefully and systematically about what kids do, how they think, and how they might engage with the world in many different ways. I know only very recently I complained about what happens when we only talk about great teachers, but at a moment when I'm feeling a little "meh" about where I am and what I'm doing, reading about this school was electrifying. That hard and engaging were not mutually exclusive? That no one was too worried about the fun kids might have in school and they liked going anyway? Sweet, sweet relief. OK. Pro Publica put together a list of great school cheating scandals. It shows that as long as there have been tests, there have been cheaters. Standards indeed. Still, the fighting games are the iPad are problematic for all kinds of reasons. A Terminator game my boy has (and yes, I know I'm the person who bought it for him, judge if you like, that's not my business) is very realistic. Sure the good guys are human and the bad guys are robot aliens, but the dystopian city they're fighting in is distressingly vivid, as are the guns, which have the added bonus of being large. And yet, and yet. A few weeks ago when Elliot was busy playing the Terminator game with me sitting next to him, he showeed me how all the humans, except for the one doing the shooting, had been locked in prison. He pointed to a man in a cell and the bunk bed behind him. The top bunk was made up neatly with what looked like a standard issue army blanket. "See," he said, "he's got a really comfy blanket for his bed. That's lucky, right?" Sure just beyond the prison walls there's a city crumbling after an invasion of violent, evil, robot aliens, but inside, the men have their comfy blankets, their cozy cells, and that's pretty lucky. That's the detail that matters. I just keep reminding myself that Weiner's district is up for elimination anyway. But Representative Debbie Wasserman Schultz of Florida, the chairwoman of the Democratic National Committee, said the district’s large concentration of Orthodox Jews made it unusual and meant the race had few national ramifications. And while I'm sad about our disappearing president, I really, really, really can't contemplate 1012-16 without him in that office. "As it is, our students now read effortfully and slowly, and with only imperfect comprehension of what they have seen. They limp into the texts of the humanities (as well as the texts of other realms of learning)." Her solution? Devote the first four years of elementary school to reading in all its forms (and mathematics) (parentheses hers). These forms include singing, clapping to the rhythm of poems, and learning to conjoin "prefixes, suffixes, and roots as they learn new words." "I have never taught elementary school and grant that I wouldn’t know how to do it. I only see the results downstream, and wish that reading at the earliest levels provided better preparation for the higher-level intensity of the humanities." It's not that I don't think reading, in all its forms, should be a backbone of elementary education. It's not that I don't think a lot of what Vendler proposes for elementary reading immersion is reasonable and good. It's just that this is cranky version of the same old great complaint about "kids today" with a twist in the direction of our bugaboo du jour, the failure of American education. It's not new it's just snotty (no surprise) and besides the point (except for the point about mathematics). This one probably started at a dinner party table and should've been better off left there. This story may be better for tweeting, but I don't tweet, so here I go on the old school blog: Yesterday, I bring a travel coffee cup to school. I'm very proud of this. I go to the Starbucks-on-Campus counter in the lobby and ask for a small, handing the nice lady my cup. She takes it, goes over to the coffee pot, and.....OK, you know what's going to happen. She takes a paper cup, fills it with coffee, pours said coffee into my travel mug, and throws away the coffee cup. Just what I wanted! Oh! And the best small world New York thing? 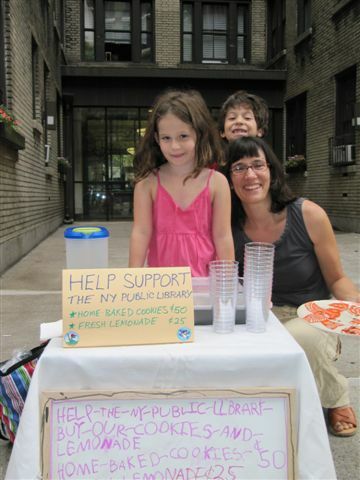 Someone who works for the library happened by and now we're on the New York Public Library's blog, too! Helen: "Is there such a place as Orangina?" Helen: "No." Here Helen looks at her shoes and furrows her brows. "Didn't Caroline (my niece, her very glamorous cousin) go to Orangina?" Me: "Ahhhh....that would be Argentina." See, kind of cute, but on reflection, not that funny. Still, I'm going to hit "publish post" on this one just maybe because I can. There's a lot to read on the subject 9/11. Here's something from Andrew Sullivan, it's very compelling. We need to understand that 9/11 worked. It worked as a tactic to induce American self-destruction, even if it failed spectacularly as a strategy to advance Al Qaeda—and its heretical message of suicidal warfare—across the globe. It worked because this was not just another terror attack. The emblems were clear: the looming towers of Western capitalism in New York, the cradle of Western democracy in Washington. When the third plane crashed into the Pentagon and the fourth (United 93) was brought down by its passengers, the drama didn’t cease. We saw the symbol of America’s military preeminence lying with its side opened like a tin can. Yesterday, my husband handed me a folded up section of the paper and said, "Here, you'll like it." I looked down and there was Charles Blow's current column, one titled "In Honor of Teachers." In it there's yet one more telling of the same old story: A teacher changed my life! Teachers are great! Teachers should be respected, like they are in countries where children do well in school! In this version, after falling between the cracks and being labeled slow Blow had an amazing fourth grade teacher who inspired him to work and by high school by golly this New York Times columnist was in a G&T program of two! Now, of course it's great that Mr. Blow's life was transformed by a great teacher. But, honestly, I'm pretty tired of hearing that teachers should be respected because of the one transformational teacher a highly successful person met along the way. I'm not saying that I'm not interested in transformational teachers or that I don't hope, fervently, that I might be one some day, at least for a child or two. What I'm saying is all the nostalgic talk about that one teacher out of many perturbs the discussion of teaching and sets up unreasonable expectations what an individual teacher should do for his students. It obscures the role of the school in supporting teaching. It elides the function of a community in which a school operates and a teacher teaches. In talking about schools and what they do the great teacher is starting to be a great big problem. Because what about the everyday teacher who's doing a pretty good job and is working steadily at doing better? What about the school that's cultivating an atmosphere in which the professional insights of teachers matter and where a culture of learning informs all decisions? And the community that's engaged by and with that school and those teachers? These stories don't necessarily make great copy but I bet they make pretty darn good schools. Fundamentally, great teaching is what matters for students and great teaching isn't isolated in one person. It's supported by institutions and communities, year after year. The romance of the great teacher is only that, a romance. Sure there are methods that all teachers might adopt, but the classroom experience that in retrospect changed everything, that experience relied on a certain chemistry between adult and child, an alignment of need and personality. When you had a great teacher, you had a relationship with that person for just one year. Remember what your life-long partnership was like after its first year? If we want to talk about what will help students year after year then it's probably time to tear ourselves away from the rosy vision of the teacher as savior and turn to the question of how teacher and student and school and community might sustain a satisfying and evolving relationship. Maybe a student who went through a school where the focus is on fine teaching and not The Great Teacher won't one day mistily recall that one Ms. Smith who showed him all he can be. But he and many others will have had one heck of a time learning every day they were there. That's my theory anyway. (Here's a footnote! "Attribution Error and the Quest for Teacher Quality," by Mary Kennedy. Educational Researcher. Vol. 39, No. 8, (pp. 591-598) November, 2010. Four hundred thirty thousand people demonstrated across Israel on Saturday night. Israel's population is 7.7 million. If 770,000 people are about ten percent of the total population, that means about 380,000 people would be five percent, that makes 430,000 people, what?, close to six percent of the population. Is that right? Even if I'm wrong, the numbers are HUGE. And what are they protesting about? The cost of living; the salaries of teachers and policemen; the concentration of wealth among an elite few families. Good golly it's heartening. Yesterday I just read a one-liner that went something along the lines of, "Obama rolls back smog regulations, capitulates to Republicans," and I thought: "Enough! "This morning I read this piece by Michael Tomasky which asks, basically, where did Obama go and will he come back in time to be taen seriously as a leader?